Joseph Ettor was born in Brooklyn, New York, in 1885. Raised in San Francisco, he worked as a waterboy on a railroad, a saw filer in a lumber mill, a shipbuilder's assistant and a stringer in a cigar factory before joining the Industrial Workers of the World (IWW) in 1906. Ettor helped lead strikes of Portland lumber and sawmill workers (1907), Pennsylvania steelworkers (1907), Brooklyn shoeworkers (1910-11) and New York City Western Union messenger boys (1912). In January 1912 Ettor went to Lawrence, Massachusetts, to help organize the workers involved in the textile industry strike. The American Woolen Company had reduced the wages of its workers. This caused a walk-out and the IWW, who had been busy recruiting workers into the union, took control of the dispute. Ettor's main role in Lawrence was to help organize relief. A network of soup kitchens and food distribution stations were set up and striking families received from $2 to $5 cash a week. He was also a fine orator and it was hoped he would be able to persuade the workers from going back to work until the union demands of a 15 per cent increase in wages, double-time for overtime work and a 55 hour week, had been granted. The governor of Massachusetts ordered out the state militia and during one demonstration, a woman striker, Anna LoPizzo was shot dead. 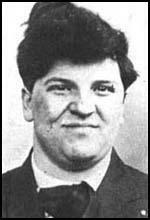 The union claimed that she had been killed by a police officer, but Joseph Caruso, a striker, was charged with her murder. Ettor and Arturo Giovannitti, who were three miles away speaking at a strike meeting, were arrested and charged as "accessories to the murder". The socialist lawyer, Fred H. Moore, was sent to Lawrence to defend them. On 12th March, 1912, the American Woolen Company acceded to all the strikers' demands. By the end of the month, the rest of the other textile companies in Lawrence also agreed to pay the higher wages. However, Ettor, Giovannitti and Caruso were kept in prison for five months without trial. After demonstrations and protests the trial finally took place in Salem, Massachusetts, on 26th November, 1912. The prisoners appeared each day fettered together in an iron cage. However, there was virtually no evidence against the men and they were all acquitted. In 1916 Ettor, along with Arturo Giovannitti and Elizabeth Gurley Flynn, were expelled from the IWW over a disagreement about the handling of a strike of iron-ore workers in Mesabi, Minnesota. Joseph Ettor, who spent his last years running a fruit orchard near San Clemente, California, died in 1948.